"The mission and purpose of this website is to educate and inform all who wish to know, the truth about Islam. We have examined the Quran and the Hadith and have a duty to share the truth with the world. Our statements and reports are not given to sound hateful, spiteful or demeaning. We have scrutinized Islam's true history and motives under the light of the Gospel of Jesus Christ. The results of our study and the many resources we have found will be published on this website". The physical threat is real. Click here to view a regularly updated listing of Islamic terrorist incursions in America. Here is a link to an interesting youtube video from The Endless Love of Jesus Ministries. It is long so you may need to bookmark and return to it when you have several hours to digest this information. It is titled "Allah & Muhammad had nothing to do with the Quran or Islam - Islam is founded on Lies & Deception". June 29, 2017- President Trump's executive orders attempted to protect and defend our borders and people, which, of course, is a sworn duty of the federal government. Although blocked by lower courts, the issue has made its way to the Supreme Court which confirmed that the executive order was largely in order and the safeguards can now proceed. Click here to read what The Supremes had to say. Read the article in the New York Times of December 4 2017, written by Adam Libtak. March 2017- A new President and new administration have been in office less than 100 days. How refreshing, to hear the new President talking about We the People and Our Country more than the "I" of the previous administration. President Trump speaks of keeping his promise to the people to protect our borders. His attempts to do so are within the constitutional responsibility of the federal government to protect and defend the American people, and enforce existing laws. The chief imports of terror were, in fact, designated during the LAST administration although there was little action to protect and defend the American people. Here is the link to the President's attempt of March 6, 2017 to protect us from terrorist incursions to this country. We can be more secure realizing that President Trump has enough wisdom and honesty to recognize and verbalize the threat of radical Islam and to take concrete steps to end the threat. This paragraph will end as it began. The physical threat is real. Click here to view a regularly updated listing of Islamic terrorist incursions in America. Ignore it at risk to your loved ones and your liberty. It is hard to know where to catalog the following link... under Politics? Religious Liberties? Islamic Threat? Christian or Cult? Perhaps "Know They Enemy"? You be the judge. Recently, May 2015, one of the messages on the weekly changing marquee in front of the church, brought about a great deal of feedback from a wide spectrum of people. Although there was quite a release of venom in our direction, there was also a heartening amount of support from those who have considered and understood the message. Please click here to read the church's press release of May 9th, 2015. 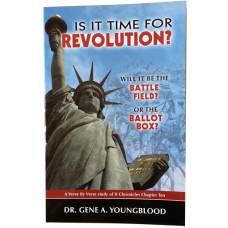 Dr. Gene A. Youngblood's most recent book arrived from the printer today. It is titled "A Nation On Trial- America Stands Before God." It is a verse by verse study of Isaiah Chapter One. "A sinful nation... having forsaken the Lord... the whole head is sick... and the whole heart faint"- words that will strike home as you consider our world today. Learn more in the book, and take heart there is a remedy. Click here to view and the book at the C.T.U. online bookstore. 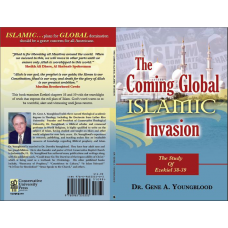 Someone recently mentioned the relevance of Dr Youngblood's book "The Coming Islamic Invasion" in light of the atrocities of Boca Haram in Nigeria and the murder of the newspersons of Charlie Hebdo in France. Here is a link to his book. 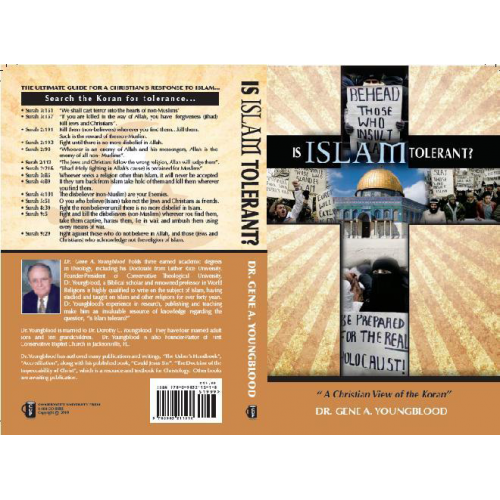 While you are visiting the bookstore, you may wish to check out the earlier title "Is Islam Tolerant"
Adolph Hitler said, "When an opponent declares, "I will not come over to your side," I calmly say, "Your child belongs to us already... What are you? You will pass on. Your descendants, however, now stand in the new camp. In a short time they will know nothing else but this new community." Brigitte Gabriel, the Founder of ACT! for America is a knowledgeable voice about the influence of Islam in our government, and thusly our educational system. She is the canary in the coal mine warning us of the autocratic threat to Western civilization. By being aware and becoming proactive to stem the insideous creep of oppression, we can stop this enemy of freedom. Please take 15 minutes and learn how our children are being indoctrinated in our public schools with your tax dollars. Click here to watch and hear. First preached about one hundred years ago by Dr RG Lee. If you have 60 minutes to listen, to PAYDAY- SOMEDAY Click here. Or if you're a reader with time for 17 pages, Click here. If you have six minutes, Dennis Prager offers one of the clearest explanations of Israel's situation in the Middle East. As he is quick to mention, the solution is NOT so clear. This youtube video is only 5:38 minutes long, but you may well wish to share it with someone who is still a little confused. Click here to watch. Former British Prime Minister Tony Blair gave a landmark speech yesterday calling on the world to unite against Islamism. Tony Blair, the Former British Prime Minister, delivered a keynote speech at Bloomberg HQ in London entitled 'Why the Middle East Still Matters.' In it he described radical Islam as the greatest threat facing the world today.He argued "there are four reasons why the Middle East remains of central importance and cannot be relegated to the second order." Blair rapidly moved on to the fourth and most important reason: Islamic extremism also known as Islamism. Please click here to read more of this article and find links to the text of the speech. Honor Diaries is a 2013 documentary film by producer Paula Kweskin. Honor Diaries explores violence against women in honor-based societies... The film profiles nine women’s rights activists with origins in the Muslim (and non-Muslim) world, and follows their efforts to affect change, both within their communities and beyond. Honor Diaries premiered at the Chicago International Film Festival in October 2013 and won the Interfaith Award for Best Documentary at the St. Louis International Film Festival in November 2013. Click here to view a short trailer of this movie, Honor Diaries. The following youtube video entitled "Obama: False Hope, False Messiah" is a fine piece of work. There is a lot of truth condensed into a few short minutes. You my wish to watch it soon, since it may not be available for long. One can recognize that sometimes well meaning people and institutions can err in the side of trying to "be nice". However the mentality of automatic acceptance and accommodation, when institutionalized, can, and has, placed free societies in peril; it is the dangerous side of "political correctness." Please click here to view the video of Heidi Mund, who has become known as "The Brave German Woman" for speaking the truth. MRFF President Michael "Mikey" Weinstein, described the student's white board quoting of scripture as pouring "fundamentalist Christian gasoline on an already raging out-of-control conflagration of fundamentalist Christian tyranny, exceptionalism, and supremacy." This “Truths That Free” section of “Ethics” has not been updated for far too long... that is not for want of material. Located in Jacksonville, Florida, in the United States, one doesn’t have to look far to find corruption, among elected or appointed officials and/or leaders or local organizations. That includes organizations with the power to arrest, detain and generally make your free life miserable. The U.S. Commission on Civil Rights will hold a public hearing next week on recent developments involving the intersection of religious freedom and anti-discrimination laws. The hearing will take place on Friday March 22, at 9:30 a.m. at the Commission’s headquarters, located at 1331 Pennsylvania Avenue in Washington, DC. CBS News investigative journalist Sharyl Attkisson on Tuesday night reported that the Obama administration has turned over documents relating to the Benghazi terrorist attack to the Senate Intelligence Committee. She made a number of revelations that don’t bode well for the White House via her official Twitter account. Please click here to read more. We were pleased to host Brigitte Gabriel's presentation in Jacksonville on May 23, 2013 at Conservative Theological University. Click here to watch a short video of April 2012 event offered in the hope that it will spur you to learn more about how you can ACT to protect our homes and culture against the threat of radical Islam. Stop Radical Islam Organization regularly produces an interesting newsletter that you may view by CLICKING HERE. Among other interesting articles, it includes videos with Geert Wilders and Florida US Rep Allen West. There was a Religious Freedom Rally in Downtown Jacksonville on March 23, 2012. Dr. Youngblood spoke at that event. To read the text of his message please click here. On the program, called "The Threat in Our Backyard," is a lecture on Islam in public schools and a short film on Sharia finance. HIGHLAND PARK, N.J. — The Reformed Church in this prosperous suburb has for years packed a lot inside its walls, including addiction counseling, a housing program, dance groups, gatherings for developmentally disabled people, a restaurant, a thrift shop and space to worship for hundreds of people from half a dozen religious congregations. Some of the Indonesian Christians seeking to avoid deportation wear ankle monitors to ensure compliance with court orders. In the years following the 1979 Islamic Revolution, Iran’s 300,000 Baha’is faced escalating persecution. Hundreds were executed or “disappeared,” and thousands were imprisoned or denied employment. Their crime: living in a rigidly theocratic state but believing in the ultimate unification of all religions. At the United Nations last fall, Canada’s Foreign Affairs Minister John Baird cited the plight of Iran’s Baha’is, women, Christians and dissident Muslims while announcing plans for a Canadian Office of Religious Freedom. Six months later, it’s still not entirely clear how the office will operate or what it will do beyond a vague mandate to address religious persecution around the world. Baird continues to hold consultations with religious leaders in Canada and elsewhere. A legal expert, a former Navy chaplain, and a pro-family leader agree that a Pennsylvania judge should be removed from the bench for throwing out an assault case lodged against a Muslim who attacked an atheist dressed as a zombie Muhammad at a Halloween parade last year. Judge Mark Martin is an Iraq war veteran and a convert to Islam, according to George Washington University law professor Jonathon Turley. The incident, recorded on video, occurred on October 11, 2011 at the Mechanicsburg, Pennsylvania Halloween parade. Ernie Perce, an atheist, was attacked by Talaag Elbayomy, a Muslim, because of the former's costume. Judge Martin threw out video evidence of the assault, dismissed the testimony of an eyewitness officer, and then lectured the atheist victim about the sensitivities of the Muslim culture. He stated in court that Elbayomy was obligated to attack the victim because of his culture and religion. Saudi Arabia – Moderate Voice or Draconian Monarchy? Saudi Arabia’s hardline ultra-conservative religious council, the Majlis al-Ifta’ al-A’ala working in conjunction with Kamal Subhi, a former professor at the King Fahd University, have just released a ‘scientific study’ that has come to some rather outlandish conclusions. The Obama administration issued talking points for commemorations of the 9/11 attacks at home and abroad. There's little that's intelligent or informed about Time magazine editor Richard Stengel's article "One Document, Under Siege" (June 23, 2011). It contains many grossly ignorant statements about our Constitution. If I believed in conspiracies, I'd say Stengel's article is part of a leftist agenda to undermine respect for the founding values of our nation. Responding to the IRS removal of tax-exempt status for the Council on American-Islamic Relations, a Virginia congressman has asked the federal agency to investigate whether the D.C.-based Muslim lobby group has "illegally received or solicited funds from foreign governments or agents." Israel is the only country that has guaranteed freedom of all faiths in Jerusalem, which must remain undivided, Prime Minister Binyamin Netanyahu told Congress Tuesday. Interrupted dozens of times by standing ovations, after minutes-long applause as he entered the chamber, Netanyahu also said that there are 300 million Arabs in the Middle East, but the only ones who are free are Israeli citizens. As part of the well-planned Islamic invasion of the world, there is a movement (logically rising from the "diversity' camp – where else?) to promote Islamic art and culture … and to use our tax dollars to do it. A lawsuit has been filed accusing Palm Desert High School in Palm Desert, Calif., of taking money from Christians who bought paving stones as part of a fund-raiser, but then refusing to include them in the final project because of the Christian "verbiage" the stones contained..
An attorney for a Christian couple who faced religious discrimination in their request to provide foster care says there’s no point in appealing a stunning decision that accused them of “infecting” children with their beliefs, because the nation’s legal system is skewed against Christianity. In his sermon, Adhami discussed Islamic oral tradition regarding "true" Muslims worthy of entering "Jannah," or the Islamic paradise. A Clinton-appointed federal judge ruled in favor of Michael Savage today in an attempt by the Council on American-Islamic Relations to extract attorney fees and costs in a case the nationally syndicated talk radio host brought against the Muslim lobby group. While many defenders of Weather Underground co-founder William Ayers have sought to minimize his bomb attacks on the U.S. Capitol and other landmarks because they purportedly did not target people, a former FBI informant who penetrated the group claimed he witnessed a meeting in which members discussed a future communist takeover of America in which some 25 million "diehard capitalists" would need to be killed. "10 Reasons A Muslim Cannot Be An American Patriot or Loyal Citizen of America!" Spend a few minutes with Dr. Youngblood as he answers questions about the sign posted on the church property and the impact of Islam in America.